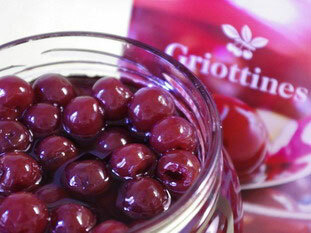 The griottines cherries are small red cherries, pitted and kept in a Kirsch syrup. The griottines cherries is a specialty of the region de Fougerolles, in France. They are found in jars of various sizes. Generally you must drain the griottines cherries before using in a bakery for example, but in contrast with an ice cream or a pudding, flavored syrup that accompany them is a great addition.